I’ve noticed that I keep cooking a lot of chicken recipes lately, which for me is not normal. I’ve never been the biggest fan of chicken, I prefer beef or seafood. When going to restaurants, I would never order the chicken. Ever. This has changed. I don’t know when the change took place, but I have a new interest in chicken. It’s by no means intentional. I still won’t order chicken at a restaurant, unless it is the best option on the menu, which to me says more about the restaurant. I think it’s because chicken is so versatile and easy to cook with. It has a non-specific flavour and isn’t as sensitive as something like fish where there’s a thin line between over-cooking and under-cooking. My favourite chicken recipe would have to be a simple chicken soup with pastina, shredded chicken and a clear broth. It’s a winter staple, cheap, and makes you feel better. My next favourite dish – butter chicken. I know it’s such a cliché dish, everyone orders it. But gees its good! I’ve made a butter chicken in the past which was meh, ok. But when I came across Jimmy’s recipe from the Season Two Masterchef book, I just had to make it. The photo alone was amazing, but it was the fact the recipe came from Jimmy. The judges always loved his curries so I figured I probably would too. And yep, it was good, really good. I missed one crucial step because I tried to juggle too many things at once. I forgot to marinate the chicken in the yoghurt. This would have made the chicken so so tender. I also changed one other thing and that was adding a teaspoon of ground cumin, only because it’s my favourite dried spice and I had to put it in. Other than that the recipe was flawless. 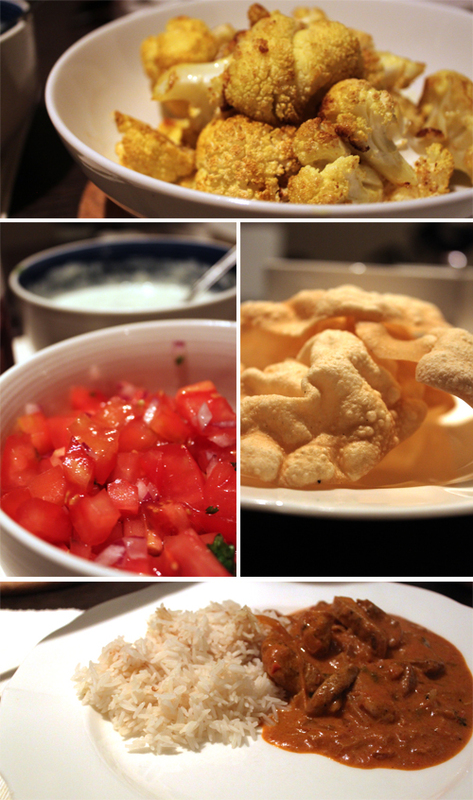 I served this dish with some raita, tomato salsa, pappadums and dry roasted cauliflower. This was easy. For 4 people, use half a head of cauliflower and cut it up into little florets. In a baking dish, add a good slug of olive oil, one teaspoon of ground turmeric, one teaspoon of ground cumin and a teaspoon of sea salt. Mix well, then add the cauliflower and toss them so they are coated in the oil. Bake in a preheated oven of 200°C for 45 minutes or until soft and golden. Perfect. In large bowl, add the yoghurt, ginger, garlic, lemon juice, oil, coriander and garam masala, and stir. Add the chicken pieces and toss to coat in all the ingredients. Cover with plastic wrap and refrigerate for around 3 hours. Lightly oil a frypan or grill on a medium to high heat. Cook the chicken pieces in batches, for around 5 minutes, or until half cooked through. Remove from the heat, cover and set aside. Heat the ghee in a large pot over a medium heat. Add the onions, garam masala, ground cumin, turmeric, chillies and tomato paste, and stir. 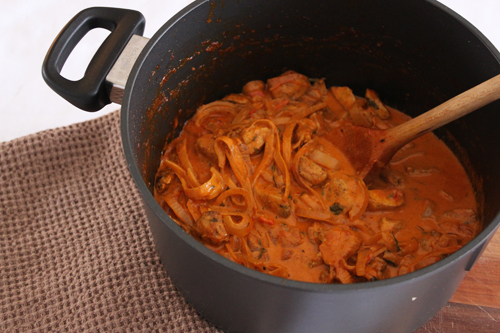 When the onions are soft, add the passata and cook for a further 5 minutes to let the sauce slightly thicken. Reduce the heat to low and add the cream and mint, and stir. After 2 minutes, add the chicken and continue on a simmer for 15 minutes or until the sauce is thick. Serves with rice, and any other accompaniments such as pappadams, raita, roasted cauliflower and tomato salsa. yumm it all looks so good! i'm definitely inspired to make something yummy tonight!